From 'Radio 1 is wonderful' to 'listen, watch, share' BBC Radio 1 is the one national network that has had to constantly evolve to address its young audience. Now in its middle age the station, understandably, rarely reflects back on its long history. After all if you remember the launch in 1967 chances are you're aged 60+. But this month its celebrating its heritage in real style with the pop-up station Radio 1 Vintage, oldies played each weekend on Radio 1's Greatest Hits and a series of Live Lounge specials. In this, the first of four blog posts, I dip into the history of the station that once declared itself to be "the nation's favourite". It's interesting, if ultimately fruitless, to speculate whether Radio 1 would have come about if not for the arrival of the offshore pirates. Before Radio Caroline burst onto the scene at Easter 1964 the old Light Programme offered little to the pop enthusiast; a smattering of current hits across the week, if you were lucky, on Housewives' Choice or Midday Spin and rather better catered for on Saturday Club, Easy Beat and Pick of the Pops. Both the BBC and the Government's attitude to popular music was equivocal. Those ex-military types who ended up as BBC producers were presumably immune to the delights of rock 'n' roll. In any case the opportunity to even expand the amount of records aired was always stymied by the restrictive 'needletime' limits, just 28 hours a week across the national services of the Home, Light and Third in the early 60s (though agreement was reached to increase it to 75 hours in 1965). By the time the pirates came along the first response was to stop them rather than seek an official alternative. As early as October 1964 there was pressure from the BBC and the European Broadcasting Union for the British Government to intervene, although the then Postmaster-General, Tony Benn, found he made slow progress. It wasn't until February 1966 that we see the first suggestions of a new 'pop music network', though it would be "separately organised from the BBC and incorporating advertisements." A few months later it was floated that the BBC's 247-metre medium wavelength be used. The Corporation itself was of the mind to provide an alternative service, planning it as "a partial substitute for the programmes offered by the pirate broadcasters." The Labour government was, by late 66, more wedded to a long-term commercial hybrid, with the BBC running a new pop service in the short term pending the creation of a new radio corporation partly financed by advertising. 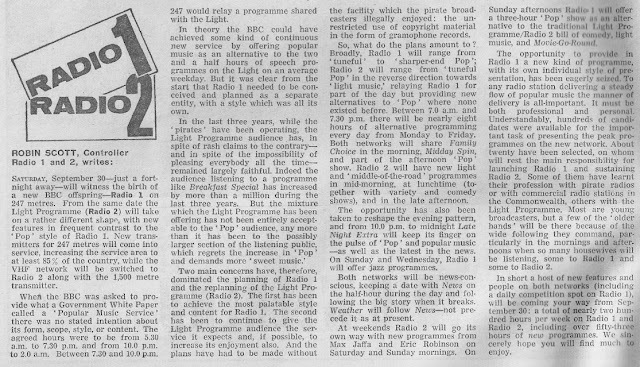 However, when the White Paper on broadcasting policy was issued on 20 December 1966 the BBC had won the argument and was authorised to start a 'new popular music programme' on 247 metres "at an early date". Part of the Corporation's lobbying had included a Q&A in the 8 October 1966 issue of the Radio Times titled Why No Continuous Pop? Not surprisingly the BBC's response immediately hit back on the issue of needletime, or lack of it. It explained that it wasn't just a case of money. More time could simply not be bought. The bogey men were, it suggested, the gramophone companies who "are in the business to sell records. They are convinced that if they are broadcast too often - especially pop records - their sales will fall off". Apparently the companies claimed to have already lost sales "because of the way the pirates are using pop records". The article then went on to partly lay the blame at the door of the Musicians' Union who believed an extension of needletime "would put their members out of jobs. It thinks there would be less work for them in broadcasting because fewer musicians would be used in broadcast or public concerts." It's hard to believe that the record companies lost sales in the pirate radio era, though I've yet to find any evidence on total sales. Undoubtedly the Musicians' Union argument did hold water, particularly in the broadcast of orchestral music. One casualty of the end of the Light Programme was the loss of Music While You Work for example, though specially recorded and live broadcasts by bands and orchestras continued to be a feature of both Radio 1 and Radio 2 well into the 1970s, even though audiences wanted to hear 'the real thing'. Mind you the BBC didn't exactly endear itself to the MU when it started using American produced PAMS jingles for its new service. Back to Why No Continuous Pop? and the Corporation was quick to defend itself. "The BBC isn't stuffy about pop. But pop is not the only kind of music". Nor, should it be forgotten, did all the pirate stations play non-stop pop: Radio 390 favoured a 'sweet music' format (plus a little bit of classical and country) and Britain Radio was firmly middle of the road. Hints were then dropped as to what might happen. "In the short term, if the Government were to ask the BBC to provide an extra service of popular music it would do its best to do so." But then it would say that, wouldn't it. What the Radio Times didn't say was that the BBC had already started to plan the new station. Robin Scott would, a few months later, be appointed to mastermind the operation - initially he was to become the Controller of the Light Programme but was already lined-up as de facto head of the new service. By now the BBC had successfully negotiated another two hours per day of extra needletime. Scott was given an additional £200,000 budget to carve out the two new networks from the remains of the Light Programme. He spent the early part of 1967 "listening, planning playing back audition tapes, drafting and redrafting schedules, taping the pirate stations' output, calculating and recalculating the allocation of the sparse needletime to the DJ shows which the new network would feature." Publically the Corporation was suggesting it wouldn't be non-stop pop: "Now, there is to be only this one network of continuous popular music, and it is obvious that no single taste can be met in it at the same time. So what we are aiming at is a good, lively mixture, with special times of the day regularly earmarked for particular attention to such well-defined sections of the audience as the pop-lovers". 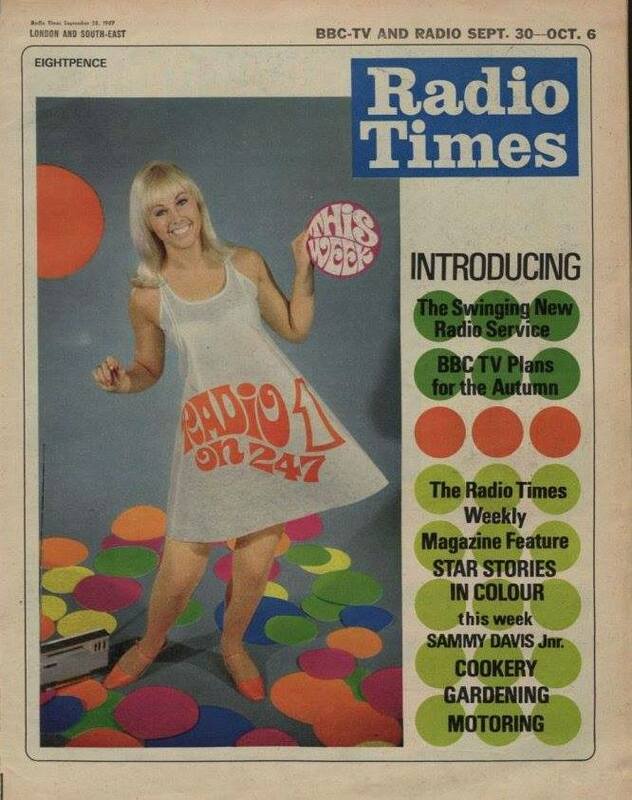 In the event it wasn't all pop, at least not initially, as flicking through back issues of the Radio Times shows the evenings were given over to folk, country, jazz and easy listening in programmes shared with Radio 2. The next month the Director of Radio, Frank Gillard, made public the plans to 'kill off' the Home, Light and Third and replace it with radio by numbers. Gillard was very much behind the new naming system, he thought the name Home Service "ludicrous" Taking his cue from the BBC1 and BBC2 television service Radio 247 would be Radio 1. Because they would share programming the Light would be Radio 2. Carrying echoes of the Third Programme name that group of services - it included the Music Programme, the Sports Service and the Study Session - was branded Radio 3, meaning the Home became Radio 4. At the beginning of September Robin Scott introduced the names of the DJs that would grace Radio 1, and many of them would pose for that famous photo on the steps of All Souls in Langham Place. There were about 30 names on the list, about half ex-pirates, the remainder existing BBC staff or contracted broadcasters. Most were on a try-out with many contracts offered for eight weeks rather than the usual thirteen. The station required a large number of jocks partly because it retained the old Light Programme system of having different presenters each day for some shows such as Midday Spin and Late Night Extra. Former pirates: Tony Blackburn, Pete Brady, Dave Cash, Chris Denning, Kenny Everett, Duncan Johnson, Mike Lennox, John Peel, Keith Skues, Ed Stewart, Mike Ahern, Emperor Rosko, Simon Dee, Mike Raven and Stuart Henry. 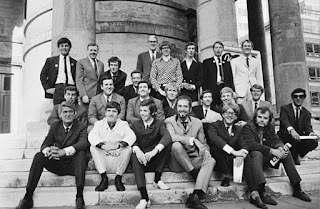 Non-pirates: Barry Alldis, Keith Fordyce, Alan Freeman, Tony Hall (presented The Joe Loss Show), Bob Holness, Jack Jackson, Ray Moore, Johnny Moran, Don Moss, Pete Murray, Pete Myers, Denny Piercey, David Rider, David Symonds, Miranda Ward (worked as a reporter on Scene and Heard but never had her own show), Terry Wogan and Jimmy Young. The bulk of the stripped weekday shows would be looked after by just four DJs: Tony Blackburn at breakfast, Jimmy Young mid-mornings, Pete Brady early afternoons and David Symonds the teatime slot. In the 16 September 1967 issue of the Radio Times, Robin Scott outlined his plans for Radio 1 and Radio 2. Meanwhile on the Light Programme Kenny Everett was helping to promote the new service. So how did it all sound? Well thankfully some off-air recordings exist of the start of both Radio 1 and Radio 2. Staff announcer Paul Hollingdale - having been selected by Robin Scott as "the natural choice" ahead of the usual Saturday morning announcer Bruce Wyndham - kicked things off at 5.30 a.m. for Radio 2. Just before 7 a.m. that subsequently much-played clip of Scott introducing the new service, George Martin's specially commissioned Theme One and then Tony's "and welcome to the exciting new sound of Radio 1" launched Radio 1. This particular edit was put together by Stuart Busby. Now you're probably thinking that the BBC Sound Archive kept a copy of the full day's output, but you'd be mistaken. Retained are Roger Moffat's closing announcement for the Light Programme, Paul Hollingdale's Radio 2 opening, all of Tony with his Daily Disc Delivery, the start and some extracts from Leslie Crowther on Junior Choice (clip below), all of Rosko's Midday Spin and the afternoon music magazine show Scene and Heard. Keith Skues took over Saturday Club from Brian Matthew on Day 1 but all that exists of it is a clip from a home recording (below) as someone obviously started their tape recorder ready for Rosko's show. Keith told me that he'd asked his parents to record his first Radio 1 broadcast but that "they became totally confused at 10 o'clock when Max Jaffa kicked in" (over on Radio 2) so he never did get his recording. He continued: "They could not discover Radio One until I visited them a few weeks later. I think they preferred Max Jaffa to the kind of music I was playing!" How was the new station received by listeners? It was mixed. "It isn't as good as Radio London or Caroline because the DJs don't sound so spontaneous". "Radio 1 is a pale imitation of the happy-go-lucky independent programmes". "I won't miss the pirates. I think I will go along with Radio 1." "I was very surprised it was so groovy". As for the press it was a similarly mixed picture. "Good in parts" (NME) "Auntie has lifted her skirt at last - and revealed a pair of amazing adolescent knees." (Daily Express) "The effect is of a waxwork, absolutely lifelike but clearly lifeless." (George Melly in The Observer) "Radio 1 resembled a poor Big L played at half speed." (Disc and Music Echo). "As a network churning out non-stop pop, Radio 1 is bound to be a huge success. After all, the rivals have been, or are about to be, killed off." (The Sunday Times). In the next Radio 1 at 50 blog post - the tenth anniversary celebrations.